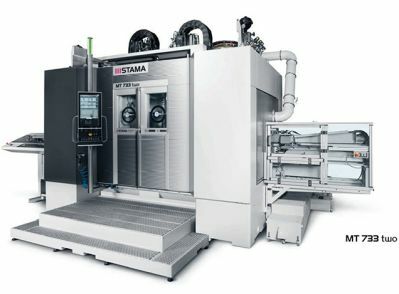 For machining a wide range of complex parts complete in a single work cycle, the new MT 733 series vertical spindle mill-turn centers from STAMA, a member of CHIRON Group, is capable of 6-sided/simultaneous 5-axis machining, including milling and turning from bar or from chucked parts in lot sizes as low as 1. The highly flexible machines are designed to fit the needs of aerospace, automotive and medical parts manufacturers. The series of one- and two-spindle machine configurations is equally capable machining a range of materials from aluminum to high-alloy steel bar from 15/102 mm diameter and lengths of 1020 mm, capable of producing work piece lengths up to 250 mm, and chuck parts with diameters up to 250 mm. Milling spindles speeds to 20,000 rpm, turning spindles to 4200 rpm, traverse speeds to 56 m/min, and spindle acceleration to 1.3g mean the series can minimize cycle times while processing parts complete. Whether machining complex parts from bar, bar segment, a semi-finished component or a cast part, all four MT 733 series models are compatible with both bar or chuck component machining. The MT 733 one, one plus, and two plus versions are also capable of "either/and" (doing both bar and chuck work at the same time). All automation options give the operator complete frontal access to the work-space. The advantage of machining all six sides in a single work cycle on one mill-turn center is that users can now produce complex components to the highest level of quality and precision requirements, according to STAMA, and easily keep up with changing volumes and part designs. The MT series offers parallel complete machining in two working spaces on a MT 733 two or MT 733 two plus for doubled process productivity. With the MT 733 series, the five steps of complete processing in a single setup include: in-feed of bar material; milling/turning of the first five sides occurs in OP 10; cutting/work piece transfer where optimized cycles synchronize the rotation location of the two rotating turning spindles to execute the part transfer from OP10 to OP 20; milling/turning the final workpiece side in OP 20, and; automated finished component outbound transfer with an integrated 2-axis gantry part-handling system. The automatic work piece infeed and output is a standard feature of the MT 733 series. Notably, the new series includes a new revolutionary B-axis drive unit with zero backlash kinematics and extreme torsional rigidity, resulting in a robust system with highest accuracy and repeatability. The MT 733 is designed with a polymer concrete base frame in a thermo-symmetric structure with high heat capacity and low heat conductivity. Adaptive software for active milling spindle compensation helps reduce temperature-related variations in the Z-direction. Active cooling of linear guides, chip channel and structural components throughout.